R Company is more than a commercial and residential remodeling team, we specialize in all kinds of interior and exterior transformations across El Paso. From rock wall construction to painting to granite countertop installation, we handle every detail of residential remodeling. We also take care of any and all commercial and residential remodeling projects. Our goal is to bring your vision to life! As time goes on, it’s common for homeowners to outgrow the size of their house or even the style of the home itself. At R Company, we don’t think you should have to move out just because you want a new interior and more space. As the most comprehensive general contractor in the El Paso area, our goal is to transform your space into something that not only reflects your needs but also includes all the features you could ever want! We offer our residential and commercial remodeling services to the businesses and residents of El Paso. We also offer professional painting services to bring new life to your home or business’s interior and exterior, as well as carpet and tile installation. Together, we will help your location achieve the originality and convenience you've been longing for. We stand by all of our projects and guarantee that you will be more than satisfied with our work! Families often live in a home for some time until they realize they need more space to accommodate a growing family or to host guests. Many people also decide they’d benefit from a home office, exercise room, or home theater. 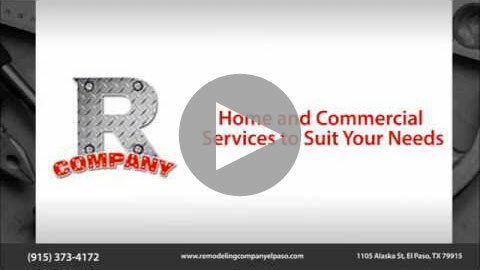 R Company specializes in home additions and spacious remodels in El Paso for all your residential and commercial remodeling needs. We keep up with the latest trends in design and we are well-versed in the best ways to implement them. We are experienced in rock wall construction, wall texture, stone veneers, backsplashes, shiplap paneling, and any other design trend you can name. We make it our priority to bring your vision to life regardless of your style and taste. Two of the most common rooms to be remodeled are the kitchen and bathroom. We specialize in installing fresh cabinetry, new appliances, and granite counter tops. We’ll also install new flooring and do away with old, outdated carpet or tile. We are confident that you’ll love your new bathroom or kitchen and your space will not only be attractive, but incredibly functional. Many businesses also benefit from commercial remodeling services. Whether it’s new countertops, fresh paint, or a complete restructure, we can handle any project. A clean and updated environment lends itself to a professional impression. If your business needs a facelift, give us a call! Don’t let business decrease just because your office or building needs some TLC. Two of the most common rooms to be remodeled are the kitchen and bathroom. We specialize in installing fresh cabinetry, new appliances, and granite counter tops. We’ll also install new flooring and do away with old outdated carpet or tile. We are confident that you’ll love your new bathroom or kitchen and that the space will not only attractive, but functional. Many businesses also benefit from a remodel. Whether it’s new countertops, fresh paint, or a complete restructure, we can handle any project. A clean and updated environment lends itself to a professional impression. If your business needs a facelift, give us a call! Don’t let business decrease just because your office or building needs some TLC. Your home is an important place where you and your family will grow and build memories. We believe that your space should reflect your style and values. Trust us to bring fresh concepts and a clean aesthetic to your space. Enjoy more room and functionality without having to coordinate every detail of the construction process! An office is no different. If your office space is getting cramped or looks a bit too old-fashioned, it may be time for a commercial remodeling service. If you're in need of a residential or commercial contractor for any kind of remodel or update, R Company is right for the job. From painting to construction, we've got you covered. No matter what your commercial space requires, we’ll make it happen. At R Company, we understand the necessity that arises when a family or business begins to grow. We value our clients and their needs, and we always work to promote great customer service and overall satisfaction with every project. So, if you’re searching for a general contractor for any kind of remodel, addition, or interior or exterior update, look no further. Call R Company today!